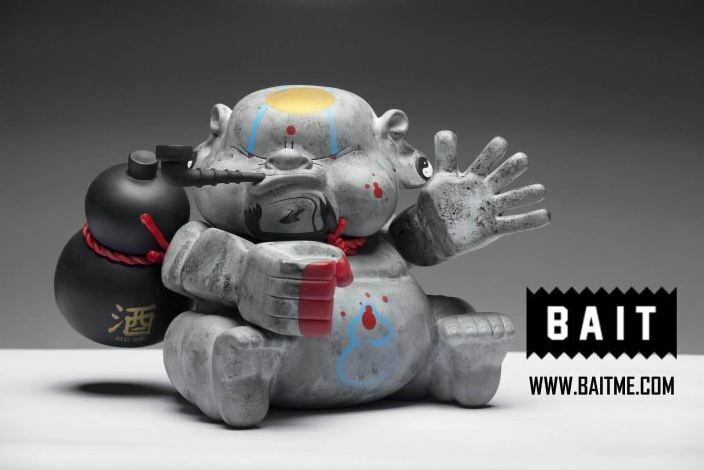 The “Stone” Bad Bad Buddha figure by BeeFy & Co. will be available exclusively at BAIT’s Designer Con booth this Saturday. The BAIT-exclusive release is limited to 100 pieces worldwide and will retail for $95. The Stone Edition features a stunning rendered stone texture running over the Buddha’s fierce yet comical build. The seven-inch deity holds an old-school pipe and gourd filled with 99% alcohol as fuel for his “badass” attitude. BeeFy of BeeFy & Co. will also be available at the BAIT booth from 12pm-1pm for an exclusive signing event. BAIT will occupy booth 101 at Designer Con on Saturday, November 3, 2012 as the convention’s featured vendor. Another sought-after version of BeeFy’s figure – the “Gold” Bad Bad Buddha – will also be available in limited quantities.